WHERE WILL WAREHOUSE BEETLES IN THE HOME? Warehouse Beetles are a small round beetle which will prosper in pantries, closets and warehouses where wheat grain, cereal and other food is stored. Easily mistaken for other small beetles, this persistent pantry pest was first discovered in the United States sometime around the second world war. Though found to infest warehouses and food processing plants, Warehouse beetles can infest any structure which harbors the food they like. This article will detail some basic biology of this pest and then offer guidelines of how to control local infestations. Warehouse Beetles were first found in United States back in 1946. However, they had probably been here long before then; they most likely were misidentified over the years since only a trained eye can tell one from all the close look-a-likes which are common throughout the States. During the 50’s and 60’s, a great amount of research would be done which has had a profound impact on how the insect is controlled in commercial establishments. Warehouse beetles are a small beetle. 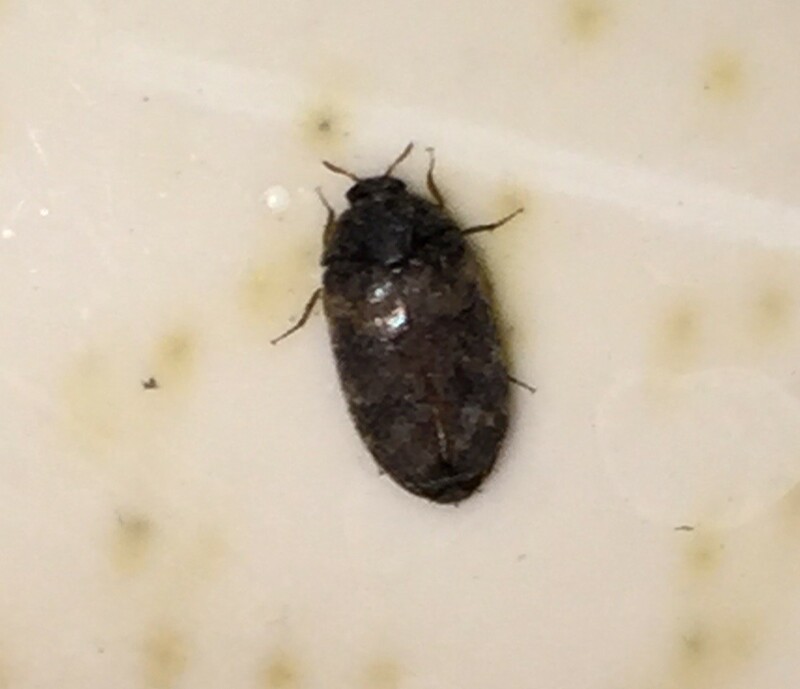 About 1/8″ long, they appear to be oval shaped with a dark colored pattern upon their back. These colors can include yellow and brown and many shades thereof which are present on their wings – the bulk of what you see. Larva will feed on just about anything though they prefer wheat, barley or rice. Other common food includes dried blood, milk, pollen and dead insects. Larva begin to feed as soon as they find food and will do so for about a month. They will then pupate into adults, which takes another couple of weeks and then spend a week or so as an adult mating and laying eggs. Though this whole cycle can take about two months to run it’s course, it’s not unusual for it to take 3-4 months. The exact time span seems to be dependent on food supply, humidity and temperature. One thing is for sure, they are very hardy as either larva or adults. Extreme temperatures won’t kill off eggs or pupa and larva can go long periods of time without eating. For this reason alone they can present themselves as a formidable foe when dealing with them in either a commercial or residential setting. Warehouses or grain processing plants which have activity will have to monitor hot points and identify just where the beetle is most active. Once identified, treatments will have to be regular and become part of their overall active integrated pest control program. Without monitoring, Warehouse beetles will soon multiply and become wide spread throughout the structure. Residential homes which have activity are not faced with nearly the amount of treatment needed or potential for large infestations like processing or storage buildings. Most homes have enough food to harbor a small breakout but not nearly enough to allow the beetle to get out of control. It appears as though the Warehouse Beetle has built in controls to deal with this since it will reproduce much slower if food supplies are limited; warehouse and processing plants which have large amounts of grain readily available tend to have quick breakouts and a tougher time overall dealing with increasing numbers. Though this could be due to their sheer size, the abundance of food and shelter clearly enables and seems to enhance the reproduction and relocating of adult and young Warehouse beetles. In the average home, infestations are almost always limited to a few rooms. The most common place for Warehouse Beetle activity in the home will be in the pantry, the garage and the laundry room. Basements are a close third and any room which is used to shelter or feed pets is always a risk. Since adults like to lay eggs where hatching larva will thrive, they tend to stay close to where they emerge from their pupa cocoons. For this reason alone it is important that control efforts are focused and contaminated food is removed. Here is what must be done when dealing with an active infestation. First, be sure you have Warehouse Beetles. Find out by setting out some of our traps. We have three types – two for use inside homes and one for use outside. The inside traps come in two forms: the HANGING WAREHOUSE BEETLE TRAPS which should be used when populations are active by flying around in open areas. These traps use a strong sexual pheromones to attract adults who have nothing but reproduction on their mind. The hanging traps use glue to capture and hold targeted beetles; the cabinet surface traps use a thick gooey oil which holds beetles in a small tray. SURFACE WAREHOUSE BEETLE TRAPS should be placed in confined areas like the back of cabinets, small pantries, etc. Since Warehouse Beetles will thrive in areas with large Pecan, Walnut, Acorn and other nut trees, we also have the OUTSIDE HANDING WAREHOUSE BEETLE TRAP. Set some of these outside to see if you have beetle activity outside the home. It is not uncommon for these beetles to thrive outside only to find their way into local homes. Such activity does not mean you have an infestation inside but foraging adults entering the home could present a problem if left alone. Install Outside Traps to attract and catch adults before they get inside. This method of control will keep them out of the home thus preventing egg laying and local outbreaks. Secondly, if activity has been noted in the home whether in the pantry, garage or some other area, you will need localized treatments as well as setting some traps out for immediate reduction of the reproducing adults. Try to identify just which rooms have activity. If it’s the pantry, try to discard any food item suspected of harboring larva or adults. If you are unsure whether beetles are present in any one item, you can store it in a plastic bag so that the contents can be examined next time you want to use that product. If beetles are then found in the future, you know it’s bad and should be thrown away. If no beetles are found after 2 months, you can use it with peace of mind there are no bugs buried inside. The plastic bag will serve you by containing any emerging adults thus preventing them from laying eggs elsewhere. Be sure to go through all items in the cabinets and pantry leaving no area ignored. The best approach is to remove everything setting items on the counter or kitchen table. Anything you find contaminated, throw away. Once the cabinets are empty, treat with PHANTOM aerosol. Be sure to get all cracks and crevices where adults like to lay eggs. Remember to treat more than where you think the main nest was located since foraging adults will seek new locations for new populations. This means its generally best to treat all the cabinets, pantry and basically any space or area where you store food and other kitchen items like utensils, plates, pans, etc. 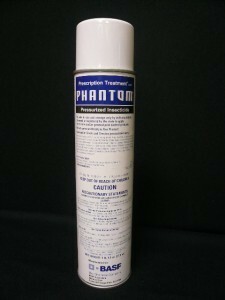 Phantom goes on dry and is odorless. More importantly, Phantom is slow to kill insects so you won’t see any dead beetles for a few days but this is to be expected so don’t panic. By working slowly, Phantom is able to impact more of the local population by getting “transferred” to many other beetles as the few that pick up the active carry it back to roost sites. Once treated, let surfaces dry, which usually takes less than an hour and once dry, put everything back away that you intend on keeping. Remember, any questionable food items should be stored in plastic bags as described above. For large homes or warehouses or if you want to ensure there isn’t a developing stage elsewhere in the structure, spray baseboards with DEFENSE SC using one of our PUMP SPRAYERS. 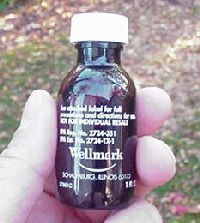 This concentrate has no odor and can be used safely in the home where people and pets are active. Be sure to spray all the rooms focusing on carpets and baseboards. And don’t ignore garages or basements. These are all prime locations for eggs to be laid. Defense will remain active for 2-4 weeks per treatment so that emerging larva will die instead of seeking food. This is important for long term control. Remember, pet food, grass seed, bird seed and other not food stuff not for human consumption may all serve to feed any population of Warehouse Beetles so it is imperative to address all areas where any such food items may be stored. 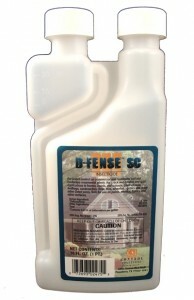 Add 1 oz of Defense per gallon of water and plan on getting up to 1,000 sq/ft per mixed gallon. Add GENTROL “egg killer” to the tank mix for extra protection. This protein based concentrate won’t affect adults. But it will stop hatching eggs from becoming adults so in the long run, Gentrol can really help end the problem. Unlike the Defense which stays in place when sprayed, Gentrol will “translocate” which means it will float around in the rooms where its applied. This means it will have a huge impact on any beetles hiding out of sight so even if you don’t spray thoroughly, the Gentrol will help. Add 1 bottle (1 oz) per gallon of water along wit the Defense in the same tank. This way both are being applied at the same time over the same area. 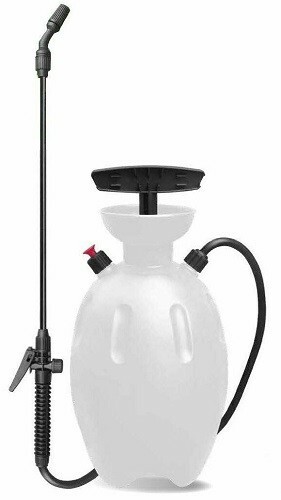 You’ll need a GOOD PUMP SPRAYER to apply the Defense and Gentrol; if you’re using a sprayer in your possession make sure its clean and free of any residue from other chemicals so you don’t render the Gentrol useless. Once you know the key areas to treat, Warehouse beetle control will be easy to achieve by setting out Traps and treating with Phantom Aerosol. If you have activity throughout the whole house, apply Defense to all rooms by spraying it along baseboards and treat with the aerosol in cracks and crevices like molding, windows and doors. Combining the traps and the treatment will help to break the Warehouse Beetle cycle so you can effectively kill off local populations and help to prevent future outbreaks.